We’re thrilled to announce winners of the Cecil Yip Doctoral Research Award, awarded annually to first year graduate students who are doing interdisciplinary research in the Donnelly Centre. The winning cohort includes students enrolled in graduate programs at the University of Toronto’s Departments of Molecular Genetics (Mogen) and Chemistry. 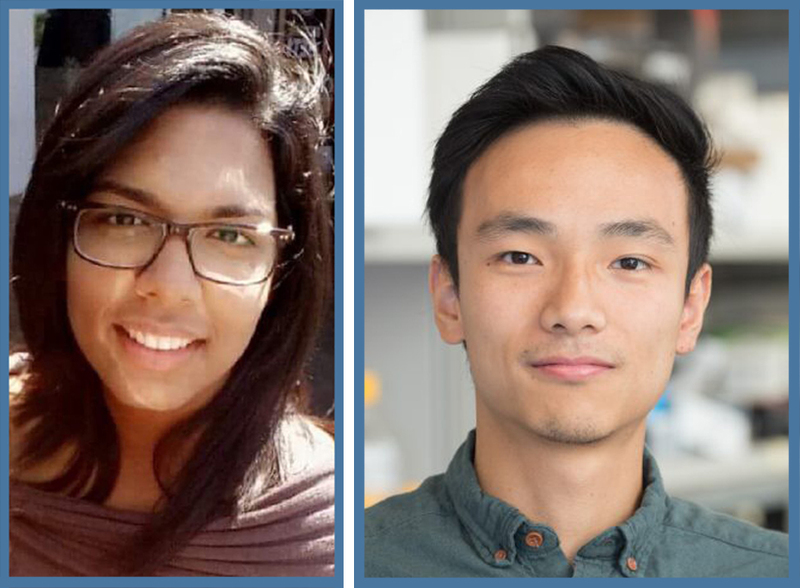 Coming from diverse undergraduate backgrounds, with bachelor degrees in life sciences and engineering, these young scientists aim to uncover new biological insights that could pave the way for future advances in medicine. "On behalf of the award committee, I would like to congratulate the winners of the Cecil Yip Doctoral Research Award," says Christopher Yip, Chair of the award committee and Principal Investigator in the Donnelly Centre. Yip is also Associate Vice-President, International Partnerships and Professor in the Department of Chemical Engineering and Applied Chemistry and in the Institute of Biomaterials and Biomedical Engineering. “These are exciting times for interdisciplinary, biomedical research. I look forward to following the progress of this year’s recipients as they start their research journey,” says Yip. Other members of the award committee were: Professors William Ryu, Quaid Morris and Igor Stagljar, who are all Principal Investigators in the Donnelly Centre. Ryu is also a professor in U of T’s Departments of Physics and Cellular and Systems Biology; Morris is a professor in Mogen and in the Department of Computer Science and is also Principal Investigator in the Vector Institute for Artificial Intelligence; Stagljar is a professor in the Department of Biochemistry and Mogen. Shubham Gupta, Cadia Chan and Owen Whitley Some of today’s most exciting advances in biomedicine occur at the intersection of biology and computer science in which advanced algorithms help researchers extract meaningful insights from a growing mountain of data. Shubham Gupta (Mogen/Röst lab) is creating a computational pipeline to analyze thousands of protein molecules in over 900 blood samples taken over time from more than 100 individuals to find biomarkers which herald diabetes. The study is part of a collaboration with Professor Michael Snyder at Stanford University, CA, and paves way for more personalized approaches in predicting risk of disease. Cadia Chan (Mogen/Zhang lab) is leading computational analysis in a collaborative project between the Zhang lab in the Donnelly Centre and the group of Michael Wilson, Senior Scientist at the Hospital for Sick Children, to uncover how diet influences puberty offset. Chan will do this by analyzing how gene activity changes in parts of the brain involved in regulation of puberty in response to low and high-fat diets. And Owen Whitley (Mogen/Bader lab) has a task of integrating diverse sets of molecular profiling data from brain tumours to find genes involved in cancer onset and progression. In particular, he is focusing on the glioblastoma cancer stem cells which are thought to seed some of the hardest-to-treat brain tumours as part of a large Stand Up to Cancer Canada/Brain Dream Team which includes over a dozen labs in Canada. 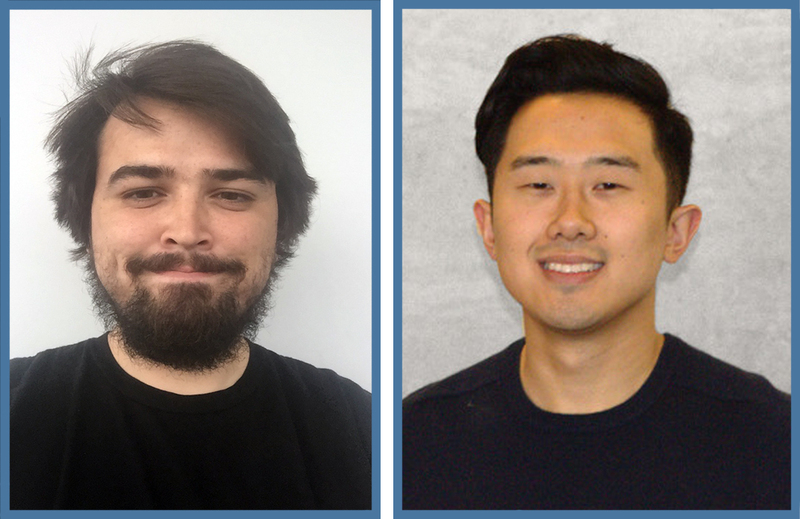 Justin Belair-Hickey and Kyle Wang Also working with stem cells is Justin Belair-Hickey (Mogen/van der Kooy lab) whose focus is on the stem cells in the eye. Belair-Hickey wants to uncover how these stem cells turn into diverse types of retinal cells, such as light-detecting photoreceptors, during development. Also, in collaboration with Professor Molly Shoichet, an expert in bioengineering whose lab is also in the Donnelly Centre, Belair-Hickey is looking to develop a method that would allow him to grow photoreceptors from stem cells in the lab as transplant tissue for future cell therapies. One of the outstanding questions in biology is how cells handle proteins that are faulty. Kyle Wang (Mogen/Andrews and Boone labs) wants to shed light on this process by identifying genes that regulate proteins’ three-dimensional shape which is crucial for their function. Wang is taking advantage of the powerful large-scale genetics platform in the Donnelly Centre which uses yeast cells to uncover global genetic networks behind basic cellular processes. Urvi Bhojoo and Yuwei Johnny Zhang Urvi Bhojoo (Mogen/Andrews and Boone labs) is also working with yeast cells but her goal is to develop a new technology for matching drug compounds to their target molecules in the cell. Finding how drugs work on the molecular level is a major challenge in pharmaceutical industry and Bhojoo’s approach, based on the gene editing technology CRISPR, has the potential to accelerate discovery of new medicines. Even when promising drugs have been identified, getting them into the right place in the body can be difficult. Nanoparticles have the potential to overcome this obstacle by delivering drugs directly into tumours for example, and other hard-to-reach parts of the body. However, once infused into the bloodstream, these synthetic vesicles don’t behave as expected because they get coated by plasma proteins. Yuwei Johnny Zhang (Chemistry/Chan lab) will identify the proteins that interfere with nanoparticle function to help improve their design. The Cecil Yip Doctoral Research Award was established in 2015 as a tribute to Professor Cecil Yip, who was the former Vice-Dean, Research in the Faculty of Medicine and a key player in both the ideology and eventual realization of the Donnelly Centre as an interdisciplinary institute at the forefront of biomedical research.